Bishkek (Russian and Kyrgyz: Бишкек) is the capital and the largest city of Kyrgyzstan. Though the city is relatively young, the surrounding area has sites of interest dating from prehistory, the Greco-Buddhist period, the period of Nestorian influence, the era of the Central Asian khanates, and the Soviet period. Bishkek, in 2008, was a vibrant, rapidly modernizing city, with many restaurants and cafes and many second-hand European and Japanese cars and minibuses crowding its streets. At the same time, it maintains the charm of a Central Asian city, with Soviet-period buildings and gardens lovingly maintained, rather than being razed and replaced by newer structures. Kyrgyzstan, dominated by the Tien Shan range, is known for its stunning natural beauty which is not lost even in the urban setting of Bishkek. Kyrgyzstan shares the problems of the former Soviet republics in making the transition from a command to a market economy, and in finding other markets to replace the vast market lost when the Soviet Union collapsed. Further restructuring of domestic industry, and success in attracting foreign investment are keys to future growth. Progress in fighting corruption is another key to the nation's growth. Bishkek is the heartbeat of Kyrgyzstan, yet its future prosperity depends on the success of the nation's leaders in bringing the country into economic and political stability. The name is thought to derive from a Kyrgyz word for a churn used to make fermented mare's milk (kumis), the Kyrgyz national drink. Bishkek is situated at about 2,624 feet (800 meters) altitude just off the northern fringe of the Ala-Too range, an extension of the Tien Shan mountain range, which rises to 15,748 feet (4800 meters) and at 25 miles (40km) distance, provides a spectacular backdrop to the city. North of the city, a fertile and gently undulating steppe extends far north into neighboring Kazakhstan. The Chui river drains most of the area. Bishkek is connected to the Turkestan-Siberia Railway by a spur. Temperatures in Bishkek range from -8.3°F (-22.4°C) in January to 68°F (20.1°C) in July. Rainfall varies from one inch (24 mm) to 6.8 inches (174 mm) a month. Stone implements found in the Tian Shan Mountains indicate the presence of human society in what is now Kyrgyzstan from 200,000 to 300,000 years ago. The first written records of a civilization in the area appear in Chinese chronicles beginning about 2000 B.C.E. Kyrgyz history dates to 201 B.C.E. The area that became Bishkek was a caravan rest stop, possibly founded by the Sogdians, on one of the branches of the Silk Road through the Tien Shan range. The Sogdians were traveling merchants from the city of Samarkand from the second century B.C.E. until the tenth century C.E. The location was fortified in 1825 by the Uzbek khan of Kokhand with a mud fort. In 1862, the fort was conquered and razed when Tsarist Russia annexed the area. The site became a Russian garrison and was redeveloped and named Pishpek from 1877. Russian peasants were encouraged to settle there through gifts of fertile black soil farms to develop. In 1926, the city became the capital of the newly established Kirghiz ASSR and was renamed Frunze after Mikhail Frunze, Lenin's close associate, who was born in Bishkek in 1885, and played key roles during 1905 and 1917 revolutions, and during the Russian civil war of the early 1920s. Heavy industries were evacuated from western Russia to Bishkek and other areas during World War II. The city prospered during the 1960s. In June 1990, a state of emergency was declared following severe riots in southern Kyrgzystan which threatened to spread to the capital. 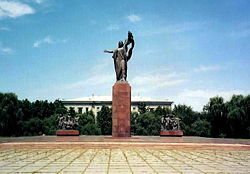 The city was renamed Bishkek in early 1991, and Kyrgyzstan achieved independence later that year during the break-up of the Soviet Union. In 2002, the United States obtained the right to use the nearby Manas International Airport as an air base for its military operations in Afghanistan and Iraq. Russia, in 2003, established Kant Air Base near the town of Kant some 12 miles (20km) east of Bishkek. The base had been home to a Soviet military pilot training school. One of its students, Hosni Mubarak, later became president of Egypt. The House of Government, Bishkek. 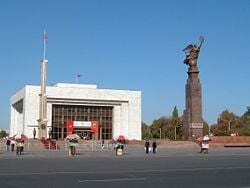 The politics of Kyrgyzstan take place in a framework of a semi-presidential representative democratic republic, whereby the president is head of state and the prime minister is head of government, and of a multi-party system that is being developed. Executive power is exercised by the government. Legislative power is vested in both the government and parliament. Bishkek is one of the seven provinces, or oblast (plural oblasttar), that Kyrgyzstan is divided into, and administered by appointed governors. Somewhat confusingly, Bishkek is both capital of Kyrgyzstan, and the administrative center of the Chuy Province which surrounds the city, even though the city itself is not part of the province. Local government is administered by the Bishkek mayor's office. Askarbek Salymbekov was mayor until his resignation in August 2005, when his deputy Arstanbek Nogoev assumed leadership. Nogoev was in turn removed, in October 2007, through a decree of President Kurmanbek Bakiyev and replaced by businessman and former first deputy prime minister Daniyar Usenov. A typical Bishkek passenger van passes by the East Bus Terminal. Kyrgyzstan is a poor, mountainous country with a predominantly agricultural economy. Cotton, tobacco, wool, and meat are the main agricultural products, although only tobacco and cotton are exported in any quantity. Industrial exports include gold, mercury, uranium, natural gas, and electricity. Before 1941, Bishkek's economic activity focussed on food processing and other light industries using local raw materials. After heavy industries were evacuated from western Russia during World War II, Bishkek became the location of machine-building and metalworking industries. However, most have been shut down or operate today on a much-reduced scale. Bishkek is the country's financial center, with all of the country's 21 commercial banks represented in the city. One of the city's largest employers is Dordoy Bazaar, one of Asia's great retail and wholesale markets, which is one the major entrepots for Chinese goods imported into CIS countries. Kyrgyzstan faces problems of corruption, and domestic industry has required further restructuring to attract foreign investment. Public transport includes buses, trolley buses, and public vans (known as marshrutkas). Trams run along selected routes. Taxi cabs can be found at every intersection. There is no subway. 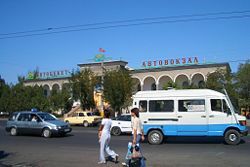 As of 2007, the Bishkek railway station accommodated only a few trains each day. It offered a popular three-day train service to Moscow, and long-distance trains leave for Siberia (Novosibirsk and Novokuznetsk), via Almaty, over the Turksib route, and to Yekaterinburg (Sverdlovsk) in the Urals, via Astana. The city is served by Manas International Airport located approximately 16 miles (25 km) northwest of the city center. Ala Too Square, Bishkek's main square. The city's population was 900,000 in 2005. The Kyrgyz, a Turkic people, comprise 69.5 percent of Kyrgyzstan's population. Other ethnic groups include Russians (9.0 percent) concentrated in the north and Uzbeks (14.5 percent) living in the south. Small but noticeable minorities include Tatars (1.9 percent), Uyghurs (1.1 percent), Kazakhs (0.7 percent) and Ukrainians (0.5 percent). Russian is mother tongue to the majority of Bishkek dwellers, and most business and political affairs are carried out in this, which is an official language. The Kyrgyz language, a member of the Turkic group of languages, became an additional official language in 1991. Kyrgyzstan is a secular state, and during the Soviet era atheism was encouraged. About 76.1 percent of the population are mostly Sunni Muslims. The main Christian churches are Russian Orthodox and Ukrainian Orthodox. A small minority of Germans are Protestant Christians, mostly Lutherans or Baptists. 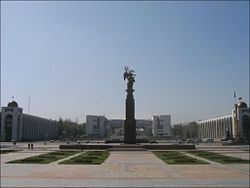 The 33 tertiary institutes at Bishkek include the Kyrgyz State National University, the country’s largest university, the Kyrgyz-Russian Slavic University, the American University of Central Asia, and the Bishkek Humanities University. Though the city is relatively young, the surrounding area has sites of interest dating from prehistory, the Greco-Buddhist period, the period of Nestorian influence, the era of the Central Asian khanates, and the Soviet period. The central area of the city is mostly built on a rectangular grid plan. The city's main street is the east-west Chui Avenue (Prospekt Chui). In the Soviet era, it was called Lenin Ave. Along it, or within a block or two from it, many government buildings, universities, and the Academy of Sciences compound are to be found. The westernmost section of the avenue is known as Deng Xiaoping Ave. The main north-south axis is Yusup Abdrakhmanov Street, commonly referred to by its old name, Sovietskaya St. Several shopping centers are located along it, and in the north it provides access to Dordoy Bazaar. The Frunze House Museum. An equestrian statue of Mikhail Frunze stands in a large park across from the train station. Mountains to the south of the city. Bishkek is the capital and largest city of a central Asian country of incredible natural beauty and proud nomadic traditions. Landlocked and entirely mountainous, Kyrgyzstan is dominated by the Tien Shan range, with many tall peaks, glaciers, and high-altitude lakes. This provides a stunning backdrop to the city, which in 2008, was a vibrant, rapidly modernizing city, with many restaurants and cafes and many second-hand European and Japanese cars and minibuses crowding its streets. At the same time Bishkek preserves the charm of a Soviet Central Asian city, with Soviet-period buildings and gardens lovingly maintained, rather than being razed and replaced by newer structures. The country is poor, especially in the south (Bishkek sits in the north, near the Kazakhstan border) and faces problems of corruption, and domestic industry has required further restructuring to attract foreign investment. Bishkek is the country's financial center, with all of the country's twenty-one commercial banks represented in the city. Bishkek is the heartbeat of Kyrgyzstan, yet its future prosperity depends on the willingness of the nation's leaders to bring the country into economic and political stability. ↑ 3.0 3.1 Statoids. Statoids. Retrieved March 11, 2012. Akaev, Askar Akaevich, and Askar Akaevich Akaev. Kyrgyzstan: An Economy in Transition. Canberra: Asia Pacific Press at the Australian National University, 2001. ISBN 9780731536573. BBC News. Country profile: Kyrgyzstan. April 3, 2008. Retrieved August 14, 2008. Encyclopaedia Britannica. Bishkek. Retrieved August 3, 2008. Kadyrov, V. Kyrgyzstan: Traditions of Nomads. Bishkek: Rarity Ltd, 2005. ISBN 9967424427. World Fact Book. Kyrgyzstan. Retrieved August 3, 2008. This page was last modified on 16 March 2012, at 16:03.